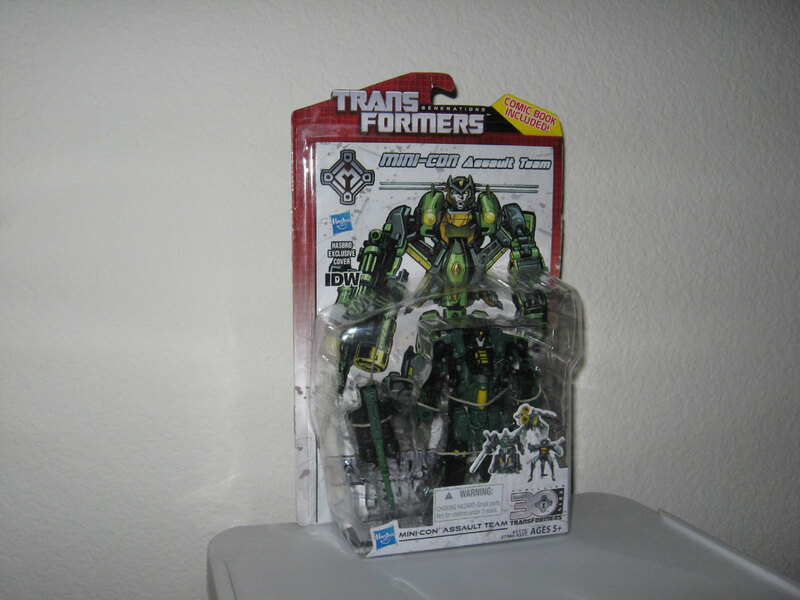 I only bought one Transformer in March of 2014. To this day I still have not opened MP Smokescreen, but I opened both MP Prowl and Streak so I’m gonna assume he’s just as awesome as these 2. In robot mode, the obvious differences for Smokescreen are the missile launchers, and possibly some minor mold alterations for the head and crotch area. 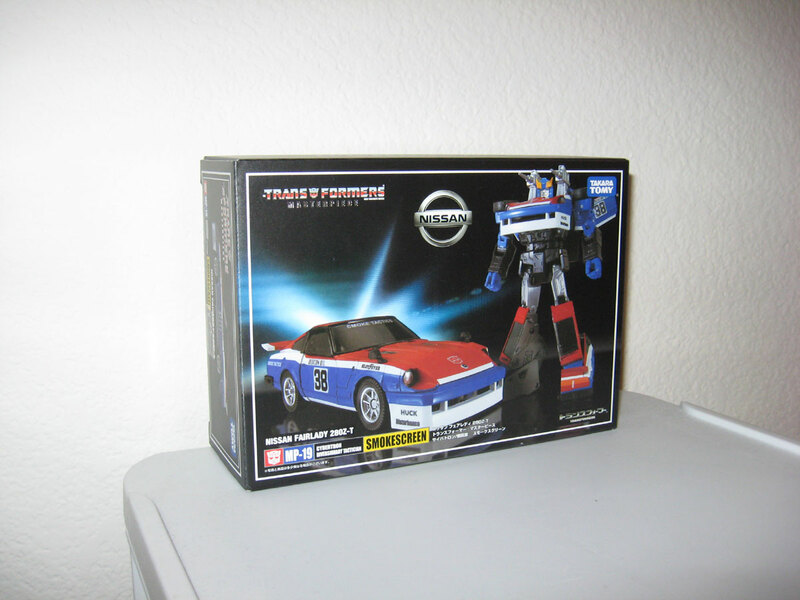 In alt mode, Smokescreen gets an enhanced front bumper/grill and larger rear spoilers. But yeah, that’s it for March. There was a real drought of TFs at that time. Things pick up later in the year when Age of Extinction is released. More to come. Transform and Roll Out! Here are the TFs I bought back in Feb of 2014. I opened all the Deluxe Generations Thrilling 30 figures. I highly recommend Armada Starscream. 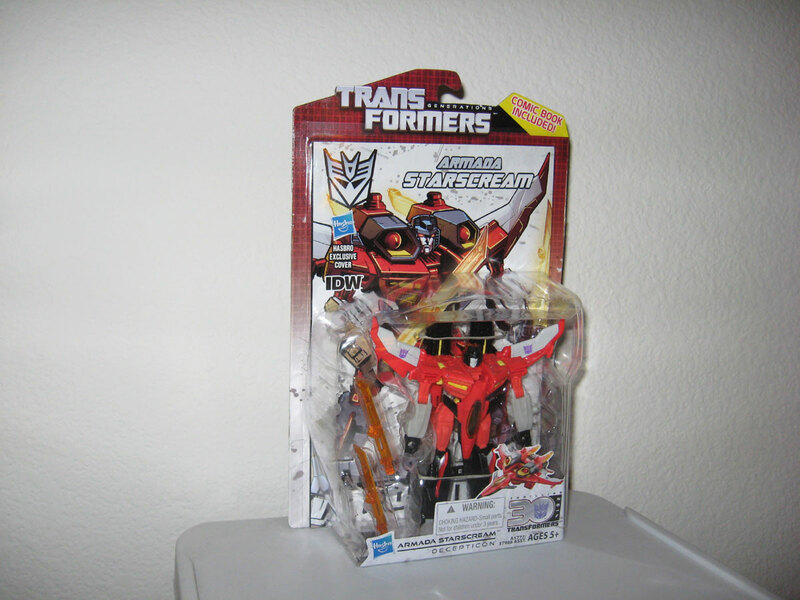 This particular version of Starscream is a welcome addition to the Generations line. I have the original Armada Starscream also (with Swindle Mini-Con), and it’s amazing to see how much this figure as evolved. 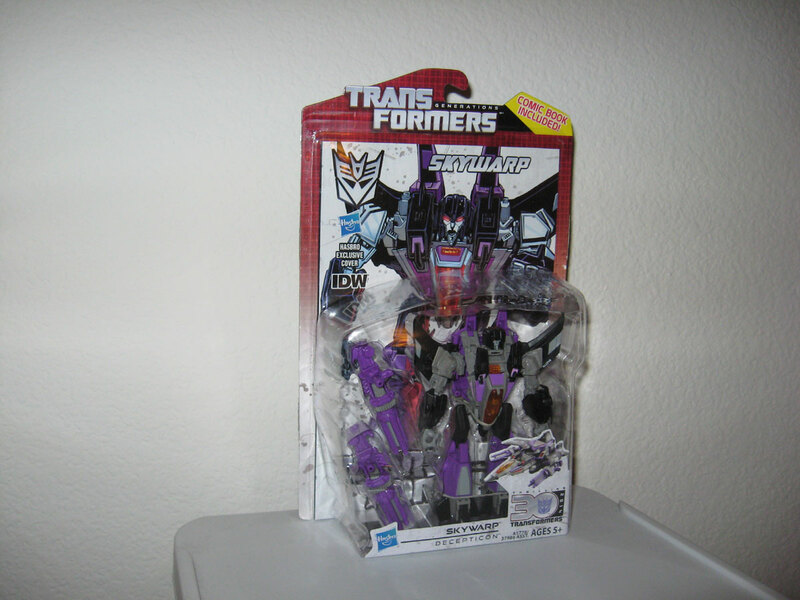 Release of Fall of Cybertron Skywarp is no surprise, given how much Hasbro likes to repaint the Seekers. Still, this is a great mold, and in my opinion the trio of Starscream, Thundercraker, and Skywarp must be completed in every line. Scoop is an odd choice for inclusion. In G1, he was a Targetmaster that didn’t appear until Season 5, by which time the US cartoons had already ended. I have Scoop from G1, and he’s still in really good shape. 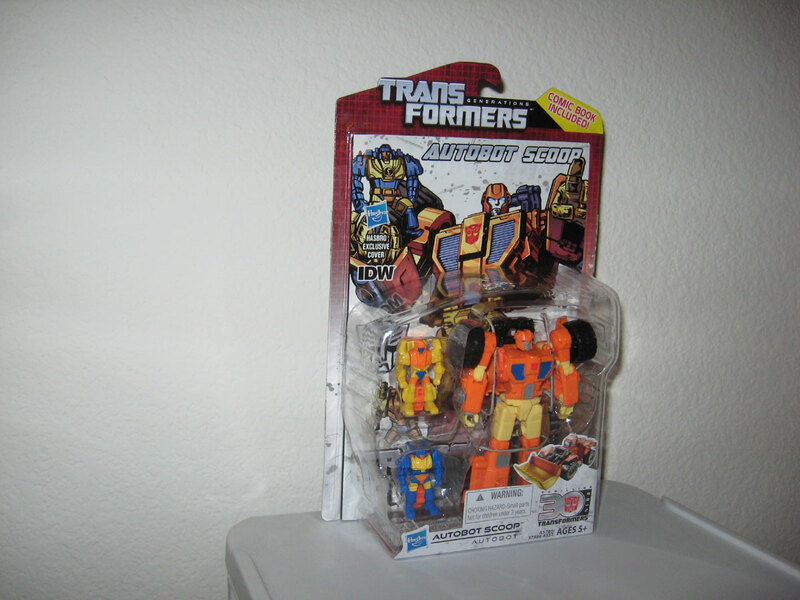 This new Scoop is a direct homage to that figure, but with way better toy engineering and way, way better poseability. He remains a Targetmaster and that is a welcome feature. The Mini-Con Assault Team is something totally unexpected for me. I’m not sure what their origins are. Still, the figure itself is decent. I didn’t like it at first, but over some time it grew on me. But I should point out that this figure does not have the best construction. There are lots of parts that love to fall off, and during transformation it’s more likely that bits and pieces will unintentionally detach. 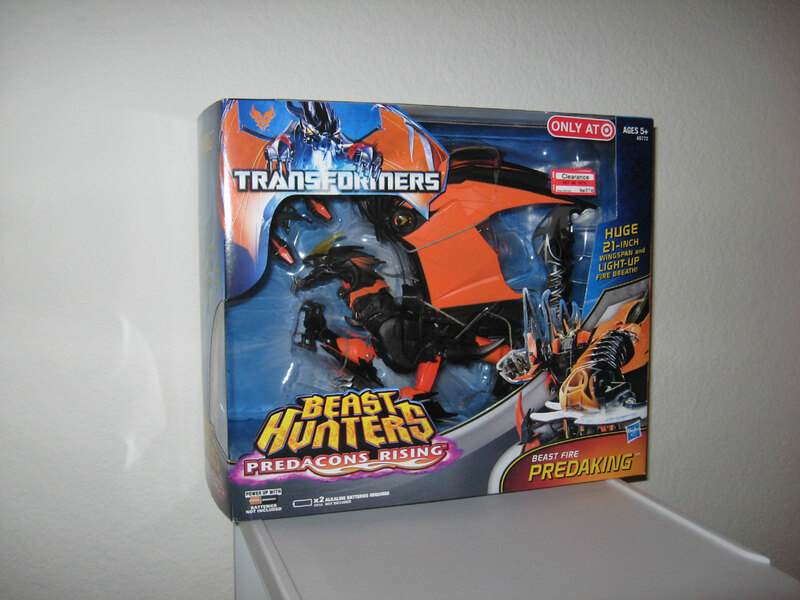 I have not opened Leader Class Predaking yet. Target was clearing these out at such a low price that I had to buy one, however. 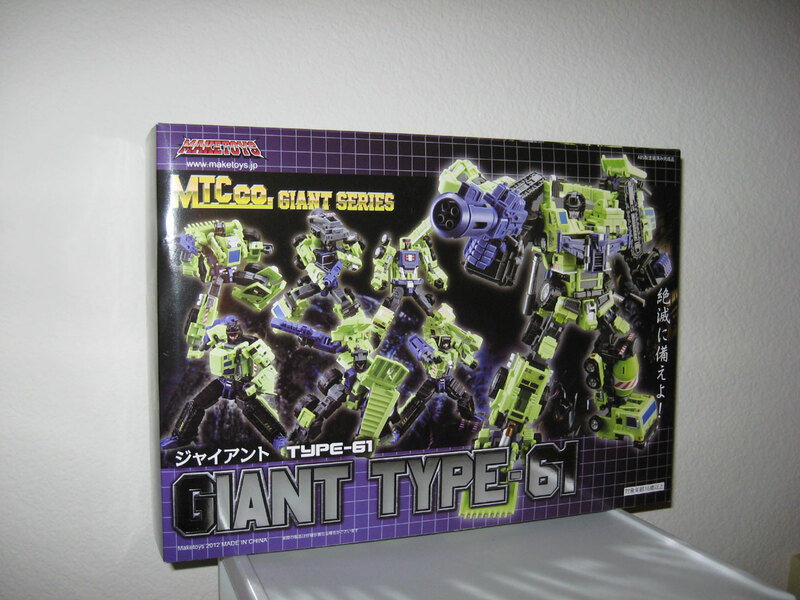 Last but not least, there’s MakeToys Giant. I missed out on buying this set when he was first released. This set I purchased is the 2nd release of the green version. There are many reviews on this set already, so I won’t go into it. 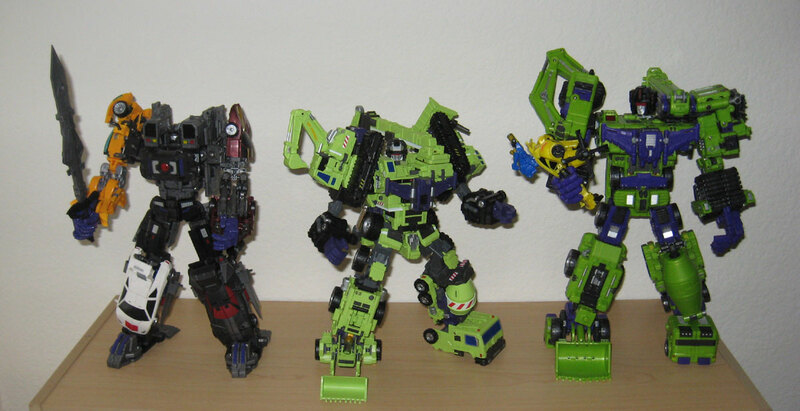 But I will say that if you like the Constructicons, then this set is a required purchase. MakeToys pays an incredible homage to the original G1 Devastator with this amazing update. 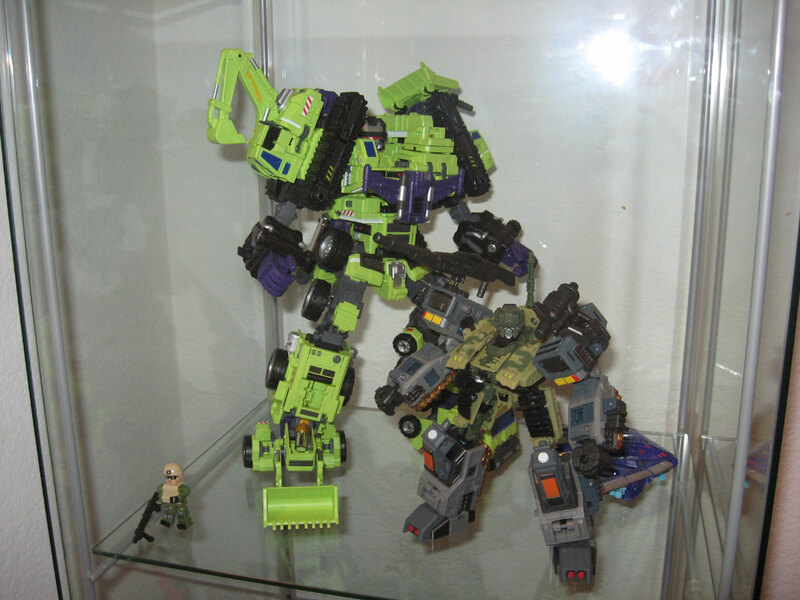 Fans love to compare this with TFC Toys Hercules and try to determine which is better. Now that I have both, I will say that they each have their pros and cons. I can’t decide so I just got both. Below is a pic of Intimidator, Giant, and Hercules all appearing together. Autobots beware! Bumblebee is already feeling the pain. 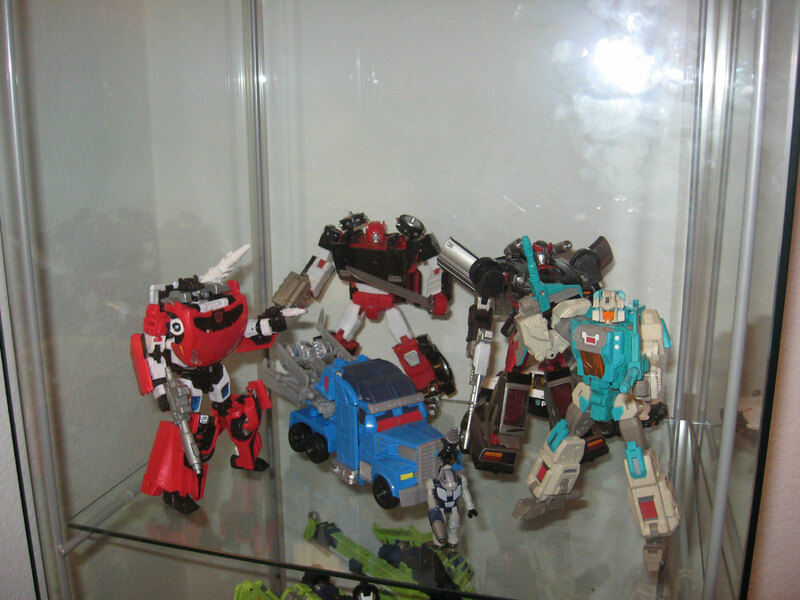 Earlier this year I bought a glass display case for all my TFs. 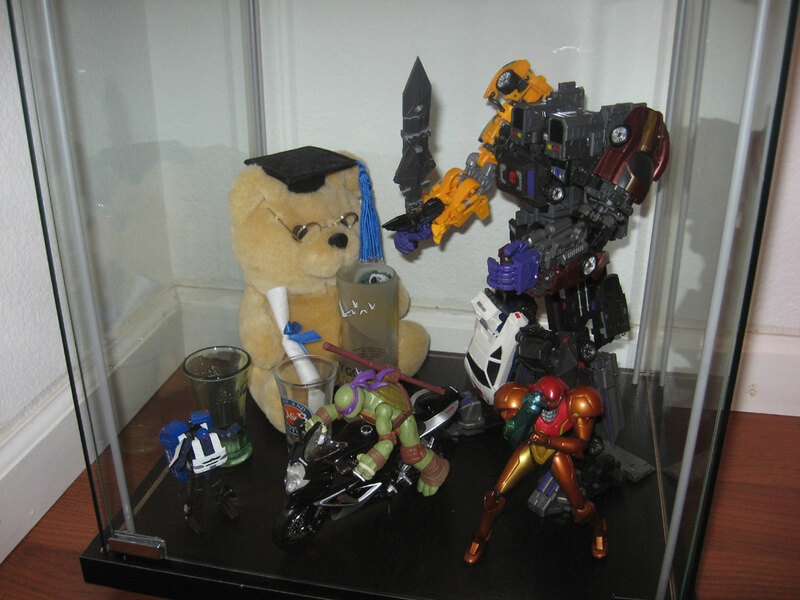 I have a small shelf in my bedroom for such a purpose, but there are too many robots I want to display. 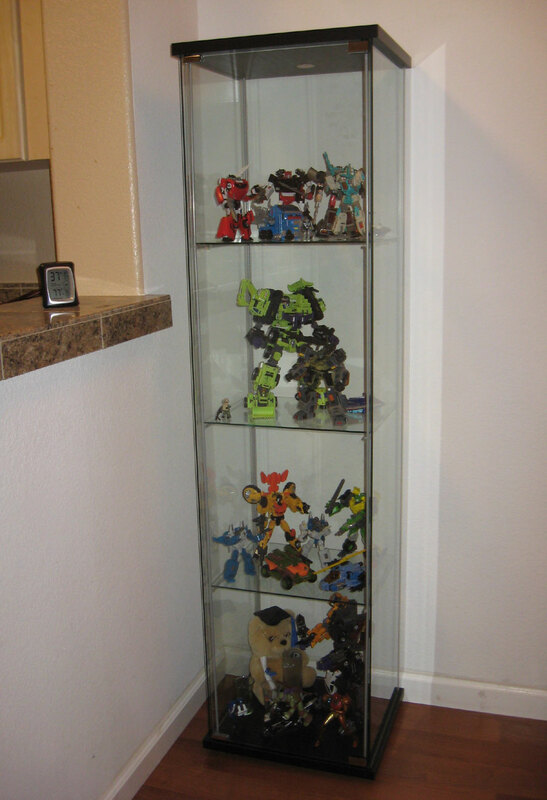 So I got the Detolf case from Ikea. It took some effort to put this case together. But in the end the display looks quite nice. Here is what I currently have displayed. Here on the top shelf is a random collection of Autobots. On display is CHUG Sideswipe with the Beelzeboss Heroic Duo Custom Kit (v2) upgrade, MP Streak, MP Prowl (hiding in the back in alt mode), MP G2 Sideswipe, FansProject Smart Robin, TF Prime Voyager Ultra Magnus, and a Mega Bloks minifig from their Battleship line. On the 2nd shelf is Maketoys Giant in the combined form, PCC Heavytread with Maketoys Mobine Armor Marine upgrade kit, Generations Thrilling 30 Dreadwing (hiding in the back in alt mode), and another Mega Bloks minifig from the same Battleship set (the GF insists I put these here). Here on the 3rd shelf is my Wreckers team! I’m so glad Hasbro is taking the time to please us true fans, as most figures here are official products. 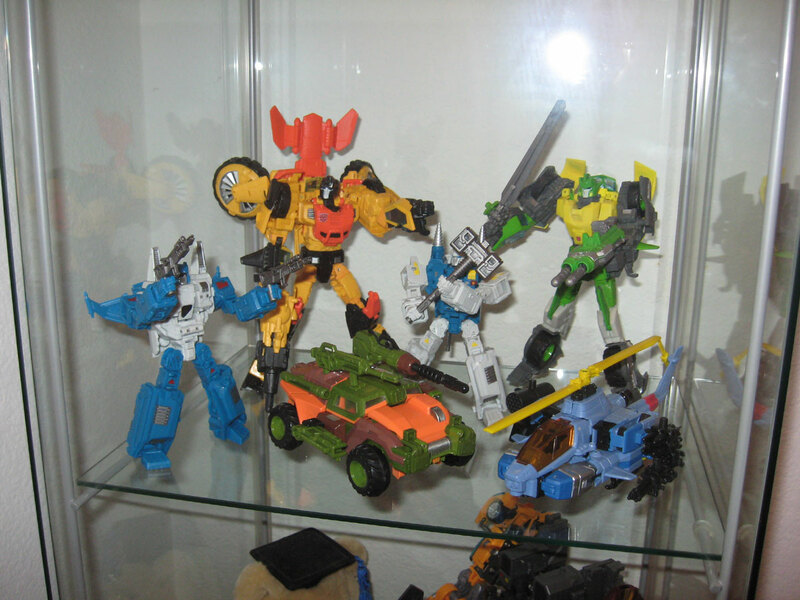 On display here are Generations Thrilling 30 Springer, Sandstorm, Whirl, and Roadbuster. And from Mech Ideas are Apex and Geminus. And here on the bottom shelf are some random stuff. FansProject Intimidator appears here in combined form. Other figures include a Samus Aran Figma, Nickelodeon TMNT Donatello riding a a Maisto motorcycle, and a Diarobo figure that transforms into a Japanese garbage truck. The teddy bear and shot glasses are random contributions from the GF. I will probably rotate out the figures in here every so often, when I want some new stuff to look at. Til next time… Transform and Roll Out!